The radiation of lemurs in this large island is phenomenal. Humans having almost certainly caused the precarious state of modern lemur distribution, it is up to us to try and work out how habitats and niches have operated in the past for lemurs' specific ecologies. It is supposed that surviving (extant) spp. now occupy the dietary niches of extinct ones. But what if the food had run out? In that case the niche would have "contracted." New resources such as introduced plants could have provided novel niches for which the authors have invented "ecological retreat concept." 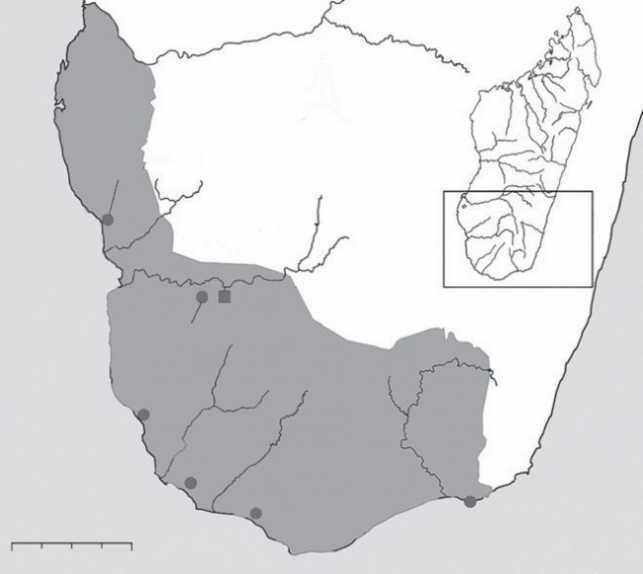 In SW Madagascar, the map shows locations for a study in which carbon and nitrogen isotope data is used to observe how lemur species nowadays have adapted to the loss of 8 larger species. The isotopic gradient in Madagascar as far as habitats or the diet of lemurs in the wild is concerned has been very strongly defined because the plants eaten vary so much. For example a cool moist habitat with a C3 (normal forest - type) plant diet produces isotope values for lemurs and their diet that are low. In comparison, CAM plants (Crassula-like succulents) as a diet in a hot dry locality produce much higher isotope values in this study. Bone collagen was used as a source of the isotopes in 4 living and 8 extinct spp. from the Spiny Thicket Ecoregion. The Beza Mahafaly Special Reserve, in the central part of the northern greyed out region, was used as a source of fur and bone for modern species. As might be expected, the surviving lemurs are much smaller than extinct relatives, but it is strange that body size doesn't seem to have correlated with less frugal diets. 117 sub-fossils were used in the sampling, along with 207 modern fur and bone samples. 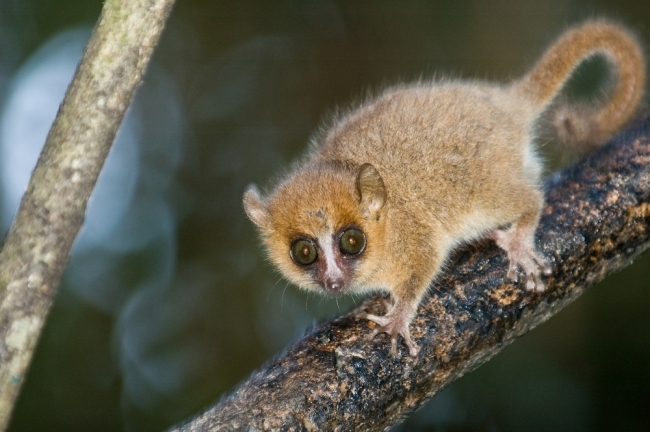 The results were quite conclusive for Lemur catta, Microcebus griseorufus and others. No competitive release was indicated. Since 900 years ago, when all really large lemurs had already become extinct, there has been no change in most measurements for this species and its likely competitors. What is indicated is a sharp reduction in the breadth of niche for every lemur species. Both 13C and 15N isotope values change to lower values within living lemurs and they also possess lower values than extinct species. Classic niche contraction seems to have taken place, but then living lemurs occupied niches that were previously unoccupied. "Ecological retreat" shows up as the most likely concept to provide answers to the problems attached to understanding the lemurs' chequered history. In the past, dry and scrubby habitats were favoured by many species, even where for example, the modern lemurs live close to streams and springs within woodland. This negates some theories that the poor old lemurs have been forced from ancient forests! Present-day species on the other hand, prefer these damper, protected forest habitats in reserves. This is possibly to avoid pressure from hunting and logging activity. But the explanation that preferred habitat has been replaced by habitats that offer some protection form humans leads us to the "ecological retreat" concept. Refuges in the trees with some mismatches in modern species between their niche and their anatomy seem a likely fit for the theorists. Complicated responses by many differing species are not best explained by either competitive release or the contraction of a niche. Only the authors' ecological retreat concept explains all of these facts in the real world. The consequences of ecological retreat theory would be dire in the extreme. What seems most likely is selection creating new interactions that also increase the risk of extinction. Overall Brooke E. Crawley et al in this paper believe an extinction cascade of these admired and beautiful creatures is highly likely. The Proceedings of the Royal Society B: Biological Sciences publish their paper today.